Vertigo is an illusion of motion, the sensation of spinning or whirling that occurs as a result of a disturbance in balance or equilibrium. Vertigo also may be used to describe feelings of dizziness, lightheadedness, faintness and unsteadiness. When you feel as if you yourself are moving, it's called subjective vertigo, and the perception that your surroundings are moving is called objective vertigo. Vertigo usually occurs as a result of a disorder in the vestibular system — structures of the inner ear, the vestibular nerve, brainstem and cerebellum — which is responsible for integrating sensory stimuli and movement and for keeping objects in visual focus as the body moves. When vestibular organs are damaged by disease or injury, the brain can no longer rely on them for accurate information about equilibrium and motion. This often results in dizziness, vertigo, balance problems and other symptoms. Many people recover from these symptoms on their own after a few weeks of normal activity because the brain has adapted with a process called vestibular compensation. Sometimes, if the vestibular compensation process is not successful, posture and balance may become overly dependent on vision, muscles and joints. In addition, the person may develop new patterns of head and body movement in an attempt to avoid dizziness and nausea. For example, a person with a vestibular disorder might adopt an exaggerated hip sway as a method of balancing, swivel the entire body rather than just the head when turning to look at something, or always look down at the floor to avoid what appears to be a confusing swirl of activity. Unfortunately, these strategies can make vestibular compensation even more difficult, worsening symptoms and often causing headache, muscle tension, and fatigue. Vestibular rehabilitation therapy is an exercise-based program designed to promote central nervous system compensation for inner ear deficits. The goal of this therapy is to retrain the brain to recognize and process signals from the vestibular system in coordination with vision, muscles and joints. 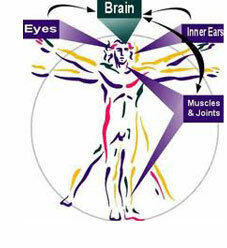 Balance is a complex interaction between these three systems.